I've always thought it would be great to have a guitar custom built so that it fit my hands and playing style in a way that no-off-the-rack axe could. But that sort of thing is reserved for people who have a whole lot of disposable income. But let's suppose I could afford to have one built. 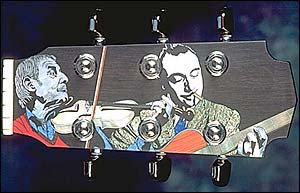 That being the case, I'd also think about having it ultra-personalized by having some custom inlay work done. 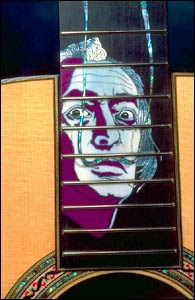 The images shown here are from the gallery of Toronto Ontario's guitar maker William "Grit" Laskin. Mr. Laskin uses a wide range of materials—shell, stone, ivory, bone and metal—which he hand-carves and engraves to give each element the fine detail he's known for. I'd like to be able to tell you that there are videos of his work, and audio samples—and I would, if the ones linked on his site worked well (if at all) so I won't. Maybe they'll work for you. I don't have a lot of content here, because I'm lazy, but what is here is fairly entertaining. Drop a note and say "Hi" so I know you were here. Email Me. Remove the junk in the address. Yep, I have a MySpace page too. It's old and stupid, and I only ever go there by way of a misclick in my bookmarks. These online entities of mine are all crap, with an occasional rarefied molecule of brilliance tossed in just to see if anyone is paying attention. Those are mostly accidents, or products of the anti-idiocy treatments I concoct in my garage.